Well, Dear Reader, this is my 50th book this year! We have come a long way since Lamentation in January. So, for the 50th, I have returned to Jeanette Winterson. I have a sneaking suspicion that this book may be cleverer than I am. It felt like a fairly gibberish story to me, but Winterson is clearly not a gibberish person. So, I have gone to find other reviews where it is variously described as a ‘biblical parody’ and an ‘incredibly amusing re-telling of Noah and the great flood’ and the good folk at Vulpes Libris positively loved it – so I recommend reading their review for some balance. The basic premise is that in the run up to the great Flood, Noah and his media empire are trying to make a film about an ark, Noah is sort of having a dalliance with a romantic fiction writer called Bunny Mix, his sons are variously setting up hamburger chains and petrol stations and there is somebody called Gloria who has been asked to take care of the animals in the ark and is going through a bit of an existential crisis. Oh, and God is actually a bit of an ice cream cone that Noah accidentally animated, and who calls Noah ‘mummy’. I confess to not really ‘getting’ this book. It was very silly, and there were some funny lines. I suppose the concept of the pre-flood age being very modern and sophisticated and Noah then having to go to great lengths to pretend for future generations that it wasn’t is interesting. It plays with the idea of how myths begin which is quite a fun thing to mull over. But somehow it didn’t hold together for me as an interesting story – perhaps it was too self-knowing? Winterson herself describes it as just being a bit of fun or a ‘comic book’ so perhaps I was just expecting a bit more from it. It is a really thin book, but it has taken me days to read it because I just found myself glazing over, or completely losing the thread. I suspect this on is a bit like marmite – one to try for yourselves. 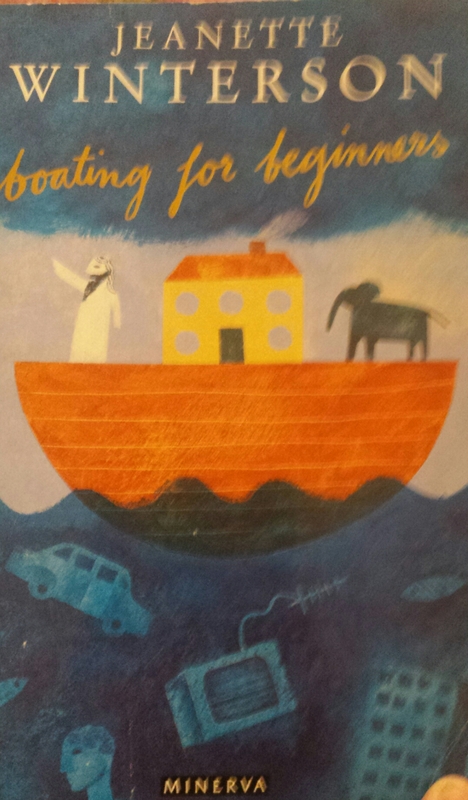 Tags: Boating for Beginners, book, book review, books, Jeanette Winterson, Noah. Bookmark the permalink. I’ve never heard of this one – and it does sound like you have to be in the right mood for it. 50 books since the beginning of the year? That is amazing! Hello! Yes, I think you have to be in the mood. I also think you have to be not expecting the usual Jeanette Winterson book – I think if I had not had her other books in my mind when I read it then I may not have been so thrown by it. It isn’t her usual style! I can’t quite believe I’ve read 50 either. Time has gone fast. I’ve really been enjoying the blogging though – and it has been great reading other fab blogs, like yours, which I didn’t do before either. Aww, too kind. Yes, it does sound like quite a change of pace from other Winterson books, which I’ve mostly liked. Jeanette Winterson is one of my favourite authors but I think this is probably her weakest book, for the reasons you’ve outlined. I think she was quite disappointed in it, and felt she had written what others expected of her for her second novel, rather than what she wanted to write – that’s why she distinguishes it from her other novels as a ‘comic book’. 5o books in under 3 months is so impressive! I’m glad it isn’t just me then that feels like that about it! I felt it lacked the depth and beauty of a lot of her other writing. But then, good on her for trying something different. I can’t quite believe I have made it to 50 – I was convinced I would have given up this challenge by mid-February – but I am enjoying it so much!